Can there be any young lad who doesn't like to dress-up as their favourite film or TV character? In this section, you'll find a cost-effective range of fancy dress outfit ideas for boys with a retro or 80s theme, from the green Hulk to orange Oompa Loompas, they're all here! 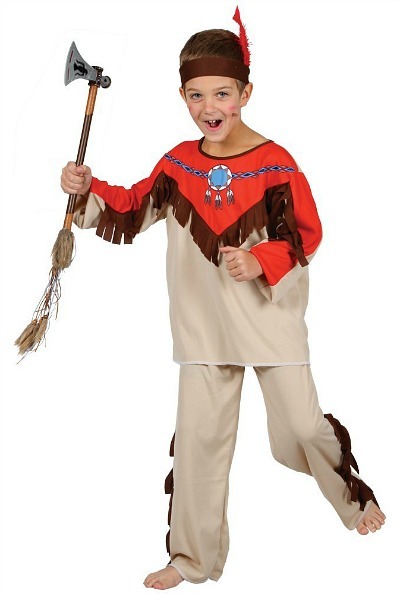 Plus, you'll also find many traditional style costumes such as cowboys and Indians, policeman etc. If you're stuck for a party idea, then why not create a theme based on one or more of these costumes? How about a superhero themed party or maybe a Teenage Mutant Ninja Turtles theme? Simplyeighties.com is participating in the Amazon Associates program. This allows us to earn fees by advertising and linking to their products. I certainly remember receiving a cowboy outfit for Christmas and had great fun playing cowboys and indians with my friends back in the day. I also had a metal cap gun and I'm pleased to see that you can still buy them. These outfits could be used for a Western themed birthday party. These outfits were very popular back in my childhood and I remember playing in a self-built wigwam made from a sheet and some canes. It wasn't very sturdy, but it did the trick! Of course, you can buy a read-made wigwam/teepee these days, as well as a wide variety of native indian outfits. Known as Where's Waldo? in the U.S. and Canada, the Where's Wally? books first became popular in the late 1980s. 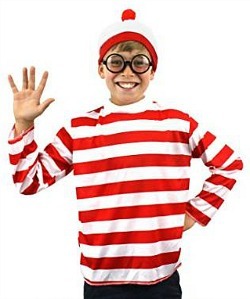 To dress like Wally, you'll need a red and white striped top, matching bobble hat and round glasses. 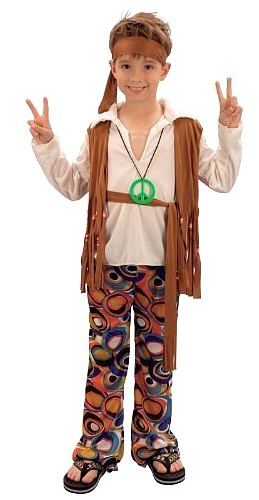 Ideal for 60s or 70s themed dress-up, there are oodles of groovy outfits available at Amazon. Typically, a costume will include a headband, a waistcoat and flower power or psychedelic pattern trousers and/or shirt. If not included, add a CND necklace and sandals to complete your look. Dressing-up as one of the emergency services is usually a safe bet with boys, especially if you're stuck for an fun idea. Unlike when I was a lad, these days there are oodles of different firefighter outfits available for boys, including variations of the theme such as Fireman Sam and Melissa & Doug. You can also buy accessory kits which include a hat, fire extinguisher, axe (obviously not a real one! ), crowbar etc. Times may have changed, but Boys have always wanted to dress-up as a policeman - I know I did back in the 1970s! 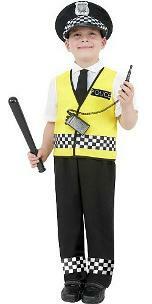 A costume should consist of black trousers, white shirt with black tie, UV police vest and a hat. 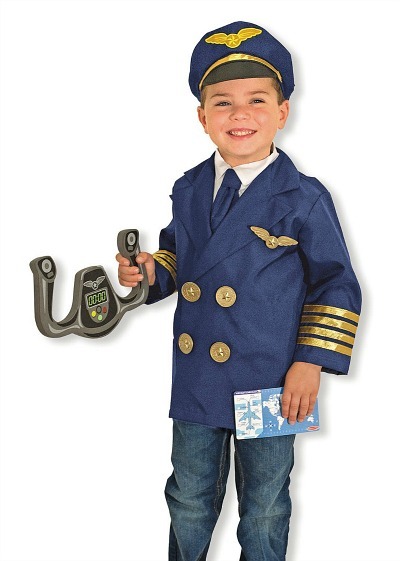 Accessories such as a truncheon, handcuffs and radio may not be included with many costumes. The official Mario™ outfit for boys consists of the iconic blue and red jumpsuit / dungarees, a moustache, white gloves, belly padding and, of course, that hat (shoes not included). However, if you're on a tight budget then there are plenty of decent non-official choices available which are substantially cheaper. Luigi is the younger brother of Mario, who first appeared in the 1983 video game Mario Bros. The officially licensed Super Mario Deluxe Luigi child costume (shown here) features a jumpsuit with blue overalls, big yellow buttons and attached green long sleeve shirt. It also includes the hat and moustache. As with the Mario costume, there are plenty of costume choices available at Amazon to suit all budgets. "To infinity and beyond!". Yes, kids just love Buzz Lightyear who, of course, first appeared in the 1995 movie Toy Story. Can you imagine how your boy's face will light-up when he receives a costume so that he can dress-up as the space ranger superhero! Typically, a costume includes a jumpsuit, balaclava and a pair of wings. This superhero has been around since the early 1960s, and the continued release of films and cartoon series has ensured that the charcacter continues to entertain new generations of kids. 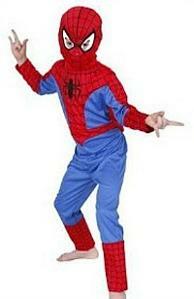 A Spiderman costume will typically include a printed jumpsuit with mask, and the prices vary greatly depending on the quality. Here's another superhero that's still going strong, and some of you may remember the camp sixties TV series starring Adam West and Burt Ward as the dynamic duo Batman and Robin. This jumpsuit shown comes with attached boot tops and cape with cowl and belt, and is based on the classic 60s costume. However, there is a wide range of choices available featuring costumes based on both the modern day and classic Batman. To form the dynamic duo, you need Robin, and this makes the costume an ideal choice for brothers or friends. The one shown includes an eyemask and jumpsuit with attached cape and belt in the classic, retro green, red and yellow style that some of you will remember from your own childhood. However, a more modern version is also avialable. Kids will have great fun dressing-up as an Oompa Loompa! Almost everyone has either read the books or watched either of the two films - the original Willy Wonka and the Chocolate Factory movie from 1971 remains my favourite. There are many costumes available, but the one shown includes the shirt, overalls, wig and gloves. The socks, shoes and orange face paint are not included, but will be shown underneath the main costume. Well, who hasn't heard of Superman? Costumes are available based on the both the retro comic books and films, and the more recent remakes. Pictured is a top quality Superman costume which has been highly-rated by customers and features a padded muscle chest jumpsuit with attached red boot covers, red cape and yellow belt. Also included are red briefs to wear over the jumpsuit to complete the retro superhero look. "You won't like me when I get angry!". If you're as old as I am, then you will remember the original TV series from the seventies - I would have jumped at the chance to dress as the incredible hulk back then! This very reasonably priced, officially licensed outfit by Marvel includes a printed jumpsuit and hard plastic half face mask. Perfect for retro, superhero, film & TV themed events and parties, and also Halloween, of course. These superheros first appeared in 1984 and there has been a resurgence in their popularity since the 2014 movie - a sequel is being released in June 2016. 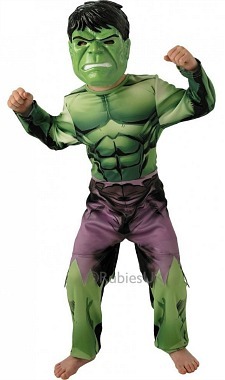 Shown is the official outfit which includes a padded printed jumpsuit, separate back shell and 4 foam eye masks so your little boy can become Michelangelo, Raphael, Leonardo or Donatello. However, there are many other costumes available. This character made his first appearance in the Captain America Comics back in March 1941, believe it or not! Pictured is a retro comic-book style half-outfit, which is a low-cost alternative to purchasing a full costume. The modern darker version (replicating Chris Evans character in the 2011 movie) is also shown. There are lots of costume options at Amazon. Since the very first movie hit the cinemas in 1977, the Star Wars series has gathered a huge following, and this is set to continue with the release of The Force Awakens. Whether you son(s) want to become Darth Vader, a Stormtrooper or a jedi, there are plenty of costume options available at Amazon UK. Ahoy me hearties! 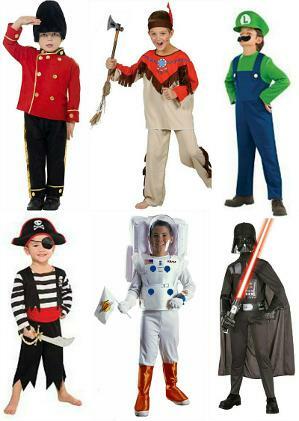 Kids love dressing up as pirates and there is a wide variety of designs available. Some costumes don't come with accessories, so you may want to add these. Fun items include a sword, hook hand, parrot, eye patch, beard, hat, telescope and a pistol. Many kids are fascinated by space, and I was thrilled the year I received a Tasco telescope (back in the 70s) which came with a map of the moon. 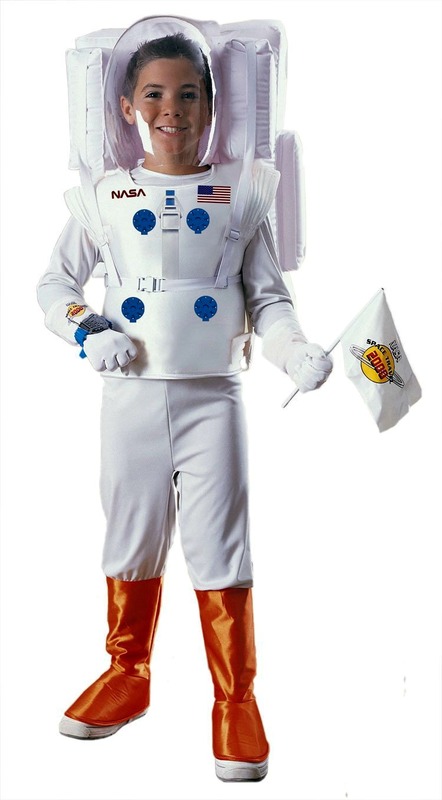 I would have loved playing around in one of these astronaut costumes and pretending to walk on the moon! There are several designs available, but make sure you add a space helmet if the costume does not include one. Sadly, I was too old to enjoy the Transformers toys and cartoons when they were first launched in the mid eighties. The costumes today look fantastic, and I'm pretty sure I would have been thrilled to wear one of these! They are all complete with mask and the hardest task will be deciding which character to go for - it may be wise to ask your son(s) which of the characters is their favourite. Here's an idea you may not of thought of. Many young boys love marching and they can march to their heart's content in one of these smart uniforms. 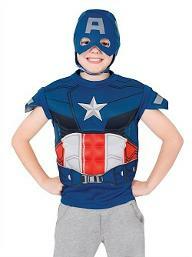 There are many suppliers selling these costumes at Amazon, with several design choices. There can't be many boys who don't like playing at being soldiers, and there are lots of costume options available including the classic camouflage army outfit to an officer's uniform. There are many fun accessories that can be added such as toy guns, hand grenades, bullet belts. camouflage play nets, dynamite sticks, toy knifes etc. Aviation is another them you may not of thought of and there are several options available including a vintage bomber Biggles style costume. A low cost alternative is to buy an airline pilot accessory kit like the one featured here. Whether it's a modern day prince, a fairytale prince or a medieveal prince, you'll find many options available. These outfits are ideal for themed events, plays etc.